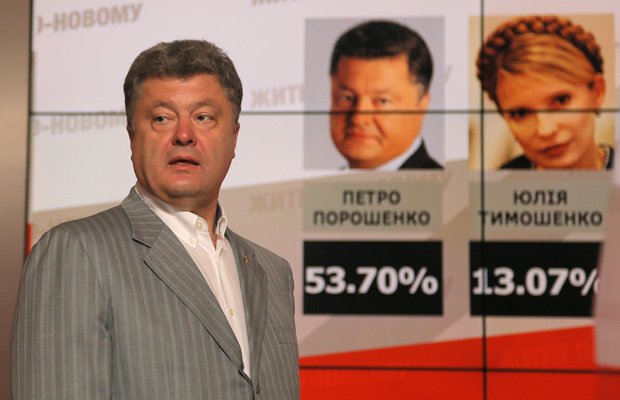 Poroshenko’s victory was widely anticipated, but the extent of his win is still impressive. Competing against 20 other candidates, Poroshenko swept every single electoral district in the country except one, according to Ukraine’s Central Election Commission. Tymoshenko placed second everywhere except the south and east, the regions where Ukraine has seen the greatest strife since the February overthrow of former President Viktor Yanukovych. President-elect Poroshenko is an oligarch and politician, known mainly for his ownership of the Roshen Confectionery Corporation and the Channel 5 television station in Ukraine. The station was a key supporter of the opposition against Yanukovych during the 2013–2014 Euromaidan protests that called for closer relations with the European Union. Poroshenko and Channel 5 were also key supporters of the 2004 Orange Revolution that successfully prevented Yanukovych from taking power in fraudulent elections and brought his opponent, Viktor Yushchenko, to power. He was a member of parliament in Yushchenko’s Our Ukraine bloc from 2002 to 2007 and served for short periods of time in his government as chairman of the national security and defense council and minister of foreign affairs. But demonstrating political flexibility, he also served a stint as minister of economic development in the cabinet of President Yanukovych—President Yushchenko’s successor and adversary. He was then re-elected to parliament as an independent deputy in 2012. While there is little love lost between Poroshenko and the Kremlin—the Russian government has repeatedly put the squeeze on his lucrative chocolate trade—he insists that Ukraine cannot achieve security without “direct dialogue” with Moscow. Poroshenko’s victory can be construed as a resounding vote for unity. The decent turnout across even the south and east—ranging from 46 percent to 55 percent outside of Donetsk and Luhansk, according to Ukraine’s Central Election Commission—is an indication of the continued health of the Ukrainian body politic, despite occupation, insurgency, and violence. On top of this, voters across the country opted for the least polarizing candidate in the pack. There may be doubts among both voters and observers about Poroshenko’s capacity to oversee a transformation of Ukraine’s notoriously corrupt political system, but he was elected first and foremost to keep Ukraine intact. The other victor in the election is former heavyweight champion Vitaly Klitschko, an opposition parliamentarian and one of three main leaders of the Euromaidan protests. Klitschko chose not to be a part of the interim government that has ruled since February and gave up his own presidential campaign to support Poroshenko. He has preliminarily won a resounding victory in Kiev’s mayoral election, and his party, the Ukrainian Democratic Alliance for Reform, or UDAR, is the overwhelming frontrunner in city council elections. Klitschko was able to avoid taking the blame for the missteps of the interim government, including its failure to maintain law and order, which resulted in horrific bouts of violence involving not only insurgents but also protestors on both sides. Others have not been so lucky. The leading party in the government, Batkivshchyna—of which Prime Minister Arseniy Yatseniuk and interim President Oleksandr Turchynov are members —has preliminarily come in fifth place in Kiev’s city council elections, with just 4 percent of the vote. However, more attention is on the other putative loser in this election—Ukraine’s extreme right. Oleh Tyahnybok, the leader of the Svoboda party, and Dmitry Yarosh, the head of the paramilitary Right Sector—the bogeymen of the Russian government and the Donetsk insurgents—received less than 2 percent of the vote combined. By no means has the extreme right lost its constituency, however. In recent weeks, nationalist support shifted to Oleh Lyashko, leader of the Radical Party and member of parliament. Since the Crimea crisis, Lyashko has emerged as the poster boy for nationalist self-defense. On the day Crimea seceded, he called for reintroducing the death penalty against “traitors, saboteurs, looters, murderers, deserters and spies.” He posted a video of himself interrogating the stripped and bound “defense minister” of the separatist Donetsk People’s Republic. Two days before the election, a paramilitary group he organized claimed responsibility for an attack on a small town hall that was taken over by local separatists, shooting one to death and wounding another. Unfortunately, some voters appear drawn to Lyashko’s extremist views and tactics. He came in third nationwide with 8 percent, earning more than 10 percent of the vote in nine regions, according to Ukraine’s Central Election Commission. In Kiev’s city council elections, preliminary results put his party in second place behind UDAR. In President-elect Poroshenko’s view, his most immediate task is shutting down the insurgency. Vowing to thwart insurgent efforts to turn eastern Ukraine “into Somalia,” he announced the day after the election that the “anti-terrorist” operation would “last just for hours,” not months. Reinforcing his point, Ukrainian forces launched a major assault Monday against insurgents who had seized Donetsk International Airport, retaking the site and killing scores. Poroshenko’s confidence comes not only from his electoral win; there are signs that the insurgency may be weakening. The May 11 unofficial separatist referendum was more farcical than the one in Crimea two months before, with no real voter rolls, few open precincts, and an ambiguously worded question concerning the “self-rule” of Donetsk and Luhansk. Days later, separatist commander Col. Igor Girkin—also known as Igor Strelkov—released a video complaining that Russian “volunteers” had come to Donetsk and Luhansk expecting to recruit an army of locals for the separatist cause but were unable to sign up 1,000 men; this out of a population of more than 6.5 million. Shortly after, Donetsk oligarch Rinat Akhmetov delivered an impassioned plea to the population—including his many industrial employees—to resist the separatists, whom he accused of committing “genocide” against eastern Ukraine. Meanwhile, the Russian government has signaled that there may be limits to its ability to wage a proxy war against an increasingly legitimate Ukrainian government. Moscow did not formally recognize the results of the May 11 referendum, but it has agreed to recognize the results of the presidential election and enter into dialogue with Poroshenko. This does not mean the Ukrainian crisis is over. The insurgents are still in control of most of Donetsk and Luhansk, which together make up some 15 percent of Ukraine’s population. They managed to thwart elections in 16 of the 22 districts in Donetsk and 10 of the 12 districts in Luhansk, according to Ukraine’s Central Election Commission. In the districts where voting did proceed, turnout was still very low—just 15 percent in Donetsk and 39 percent in Luhansk. The insurgents are unlikely to be dislodged without the continued use of force. The risk of a Yugoslav-like war in the region—and potentially beyond—remains. The president-elect’s goal is to defeat or isolate the insurgents while not further alienating local populations. The government has to offer security to the populations of Donetsk and Luhansk soon, together with concrete steps toward their full political inclusion in local and national politics. Simultaneously, the government is embarking on a nationwide program of massive economic and political reform, with the assistance of the international community. The challenges for Ukraine’s government continue to be profound. But its prospects of success are better than they were a few weeks ago. Cory Welt is an Adjunct Fellow at the Center for American Progress and the associate director and research professor at the Institute for European, Russian, and Eurasian Studies of The George Washington University’s Elliott School of International Affairs.